Puddle is a fan-run convention in Chicago for collectors of Pullip and company, it’s run by the very awesome Dal enthusiast Truefan. I had ideally hoped to attend this year but unfortunately I wasn’t able to. 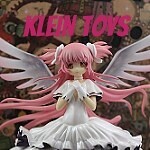 Truefan was able to obtain a limited number of the oddly named but exceedingly adorable Ddung dolls to sell at Puddle, amazingly all of them did not sell at Puddle so she placed the spares up for sale on the various doll forums. 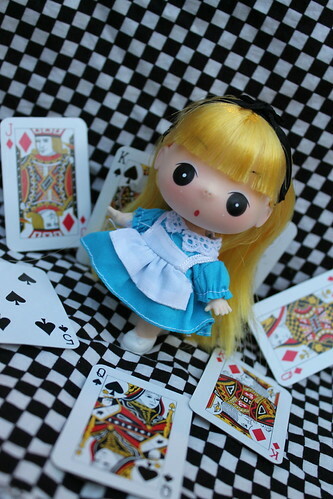 One of the extra Ddungs that she had available was the Mini Alice in Wonderland Ddung, being a huge Alice in Wonderland fan I could not resist her. Ddung is supposed to be a four year old girl, so she has a chubby little toddler body. They come in two sizes Mini which are about 4 1/2 inches tall as well as a larger size (like the one I saw at the Animadness meet) which are about 8 inches tall. 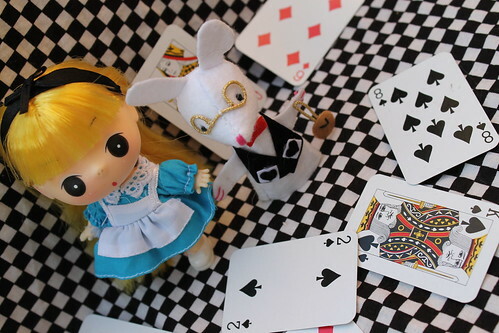 Alice is part of the Mini Ddung Story World line, as far as I can tell Alice and Little Red Riding Hood are the only two dolls that were released in the line. 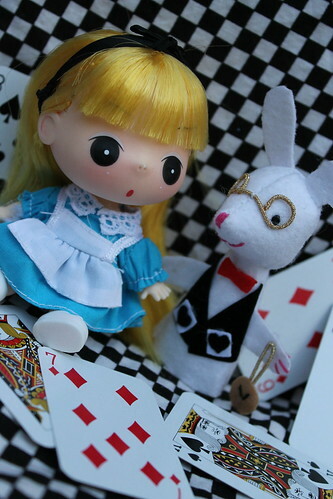 Both of the dolls come with a fingerpuppet friend; Alice comes with the White Rabbit and Little Red Riding Hood comes with a Wolf. 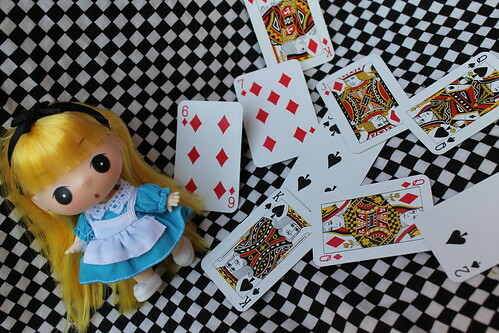 I think the fingerpuppets are a cute addition. She is just way too adorable for words. In a weird way, the minimalist detail on Ddung almost reminds me of the POP! Super Heroes line of vinyl toys from Funko. 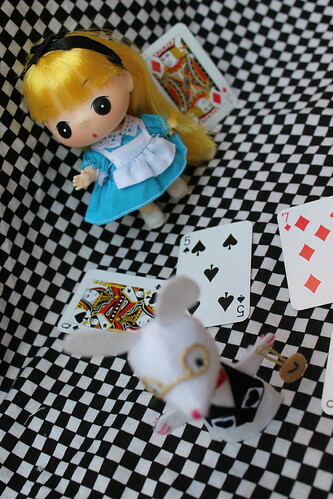 This entry was posted in 2011- 365 Toy Project, Doll and tagged alice, alice in wonderland, ddung. Bookmark the permalink.